Thank you for your interest in learning more about the NeuroQuantis principles. We would like to invite you to read the following chapters with attention as they offer a real window to thrive within a professional organisation. You are welcome to contact us with any comments and questions! The individual lives permanently within all sorts of organizations. Up until now, and even more so since the beginning of the industrial era, it was up to the individual to adapt to organizations, for the better or — still too often — for the worse. NeuroQuantis offers to take into account both the needs of the individual and those of the organization and to satisfy them reciprocally, in order to co-create a reality which is profitable both for the individual and for the larger community of human beings in general. By taking into account common needs, the organization facilitates its own growth by reducing the malfunctioning associated with humans and increasing its own performance. The individual acts in accordance with his individual growth when he satisfies all of his needs. He then works with pleasure, gives the best of himself, in accordance with his deepest individuality. Neuro : Using the four decision-making centers of the brain that process information, the manager adopts the position of the Observer and in a world of profound change, he can make the right decision regardless of the environment or events external. Quantis : the choice and the intention of the Observer creates the reality; it integrates relationship between the observed subject and the Observer. Intuitive Feeling : the inescapable link between Neuro and Quantis, the key to the whole approach. NeuroQuantis shall not be confined in any methodology. The field of possibilities is endless. This energy is exempt from any collateral damage. Axiom N°1 : The individual is an organization, the organization is an individuality. An individual is a structure made up of cells, which are both autonomous in the way they operate and programmed by DNA. An organization is a structure made up of individuals, who are both autonomous and directed by a hierarchy through which the levers of decision are distributed, in accordance with the Founder’s initial vision (or program). Axiom N°2 : The individual and the organization are intimately linked and inseparable. No organization can exist without the active participation of the individuals. A football club with no player nor spectator no longer exists. These organizations provide the individual with services and products that are quite useful, or even sometimes vitally necessary for him. Axiom N°3 : By satisfying the needs of the individual, the organization satisfies its own needs. Axiom N°4: When his needs are satisfied, the individual contributes positive energy to the organization; this energy is exempt from any sort of collateral damage. Inherent collateral damage, related to the adherent’snegative energy : Conflict, loss of motivation, stagnation, lack of initiative and creativity, depression, burnout, suicide, sabotage, internal theft, blocking information, etc..
Axiom N°5: The organization’s positioning is that much more powerful when its own goals are in alignment with the individual’s. When a problem occurs, it’s a good idea to ask yourself : What need has not been met? Any human being is a being of needs. An individual whose needs are not met, consciously or unconsciously, becomes the prey of stress. Then he’s in a ‘survival mode’, all of his actions are conditioned by fear, and he can only take limited decisions — that are limiting for the organization. The parallel is also true for the organization itself. An organization whose needs are not met becomes the prey of a tangible stress; stockholders put pressure on the CEO, who transfers it to the Board, who transmits it to the executives, who do the same with the various teams, etc. As long as the organization is not aware of these patterns which generate stress, which in turn makes the organization more fragile in its relationship to other organizations, nothing will ever change. 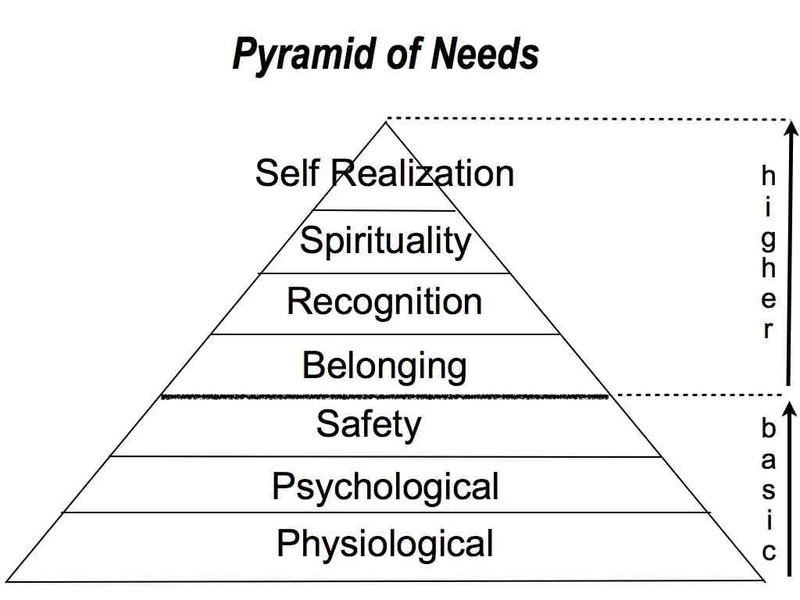 Only once his basic needs have been satisfied, will an individual try and rise up along the hierarchy of needs, with the intention of satisfying higher ones as well. This perpetual evolutionary process of needs constantly releases new energies which drive us towards action. Only the need for self-realization constitutes a constant and uninterrupted, intrinsic motivation. An individual who satisfies this need will be constantly striving to move ahead towards his own realization. He will dedicate all of his knowledge, and his personal and social resources to the pursuit of his own and others’ realization. The more we are deprived, the greater our motivation to satisfy the corresponding need. The level of activation is related to the extent of this deprivation; in such circumstances, individuals will obviously seek elsewhere the means to have their needs met, therefore completely losing interest in the organization. When the individual satisfies all of his needs, his stress diminishes, his fears regress, his level of trust increases. He can position himself as an Observer of his own reality and choose a position of distance conducive to a greater receptiveness towards his own intuition, towards making the right decision, choosing the right response, instead of inappropriate reactions. Placing himself in the position of an observer, curious and acting as an anthropologist would in order to better understand others, the individual enriches his own life context by deepening his professional, family and social relations. Having dropped his personal barriers (his masks), he communicates in a genuine fashion, receptive to the needs of others, and expressing his own feelings. The reduction of the individual’s stress provides him health, serenity, trust and energy. He sleeps better, truly rests and thus dedicates himself that much more efficiently to his work that he feels good in it, in agreement with himself. In fact, his performance increases and absenteeism — because of illness, depression, burn-out and demotivation — diminishes appreciably. The individual increases his own potential to collaborate and communicate, his capacities to think and analyze, opening wide the sluice gates of creativity and intuition, contributing all of his positive energy to the organization. Self-realized individuals – Ideal colleagues ? When he designed his notorious pyramid of needs, Abraham Maslow described a self-realized individual in the following terms… Wouldn’t you like all your employees to look like him? He expresses his ‘meta-needs’ in terms of values such as truth, beauty, divine, fulfillment, life, uniqueness, justice, order, abundance, play, living with what is, self-sufficiency. He assumes his responsibilities and never assumes the position of a victim. He has the courage to avoid taking any defensive position. He works at his ‘mission’, does it spontaneously, as well as possible, and experiences moments of pure and intense happiness. This describes a disinterested and devoted individual, totally committed to what he’s doing. Each of his choices aims at progress, wholeness and fulfillment rather than choices dictated by fear. In parallel to the satisfaction he derives from his work, the self-realized individual seeks perfect health and uses his emotional intelligence to better collaborate with others and enable them also, to become self-realized. For your employees already in place, NeuroQuantis gives you tools aimed at the realization of the individuals. For those who join your organization, NeuroQuantis enriches your toolbox when hiring, in order to assign the right person to the right function. 1/ Neurosciences : the research on the brain progresses by leaps and bounds. Based on the work of Henri Laborit (1914 – 1925), Dr. Jacques Fradin has developed the model of the ANC – Neurocognitivistand Behavioural Approach from twenty-five years of scientific research on the brain. This research, validated by tests conducted in collaboration with the medical service of the French Air Force, have been the subject of scientific publications worldwide, providing an understanding of the mechanisms underlying stress, interpersonal relationships, behaviours, decision making and motivation. 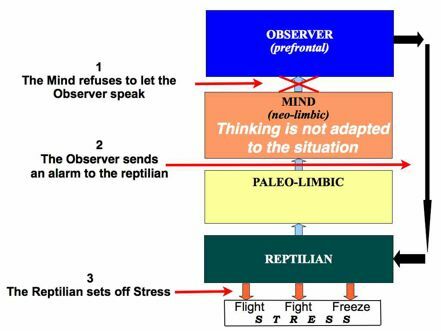 The ANC tools allow the conscious “toggle” in “the Observer posture” – the ‘prefrontal’ mode, decision-making center of the brain that appeals to our higher intelligence. Other researchers provide valuable steps to such knowledge. To Antonio Damasio, you must first stop to see the body as an instrument of the brain. The prefrontal cortex contributes to the interpretation of emotional stimuli. It is essential to reasoning, which leads to the conclusion that without emotions, we can not decide. For Mario Beauregard and others, it is the meeting between emotions and rational brain that springs consciousness, a uniquely human characteristic. The decision (caedere, Latin for “slice,”) happens in the mind, but it is an action! Emotions are a movement (e movere in Latin) which allows action. Our decision center directly involves emotion as a source of information for analysis and helps to sort through the options. “Emotion is involved in the reason; it can rather more assist the process of reasoning than necessarily disturbing, as is commonly assumed.” Jean-Pierre Changeux. But emotion does not necessarily brings good decisions: “In some cases, as with fear, emotion completely replaces reason.“Joseph Ledoux. “Emotion plays a role in intuition, rapid cognitive process by which we come to a conclusion without being conscious of all the logical steps leading to it.“Jean-Pierre Gagneux. Assuming that emotional intelligence is valuable in all cases to confirm the relevance of emotional signals, NeuroQuantis strong emphasis on “body feeling”, our best guide at every moment, alarm of cognitive dysfunction or valuable witness of the right decision. Trusting his emotions while leaving the reins to the cortex, here is the real challenge for individuals ! 2/ Quantum physics : the book called Reality Transurfing (surfing through reality) provides powerful tools through a model developed by the Russian quantum physicist Vadim Zeland – worldwide bestseller of personal development. Within the knowledge of the human, Russia provides us with powerful tools, due to the will of the communist system to better understand humans. This is also true for quantum physics and the need to control nuclear energy. According to quantum physics, the observer affects the outcome, the reality. Taking the Young’s two slots experience, Louis de Broglie comes in any case to this conclusion, followed by David Bohm thereafter (De Broglie theory / Bohm – particle holds information on the state of the equipment), as if the material played to ‘please’ the experimenter… The Copenhagen interpretation, supported by the physicists Niels Bohr, Werner Heisenberg, Max Born and Pascual Jordan discusses the influence of the measuring device on the outcome and the principles of uncertainty and causality (everything has a cause) specifics to the quantum domain. The identity of the object independently of the rest of the world disappears – everything is connected. 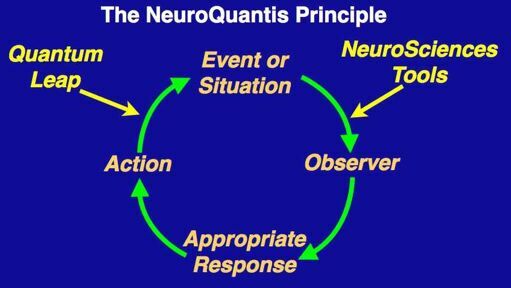 For NeuroQuantis, the intention of the Observer determines the outcome. The intention itself is directly related to the psychological state of the individual, that influence his decision and generates a corresponding result. The state of an observer, responsive and fulfilled individual is probably the best guarantee of efficient and sustainable results. 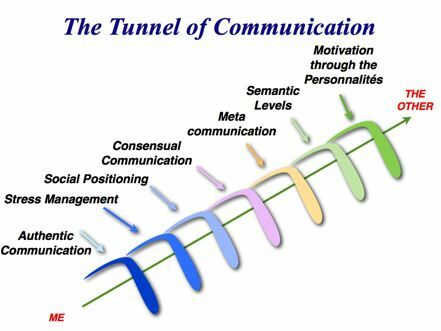 Communication process from the ANC which consists of a series of seven chronological stages that followed by the original message and allow the integration and appropriation by the other and therefore, motivation to “make live” the message. then, by a process of questioning based on six dimensions of the Observer – Curiosity, flexibility, nuance, relativization, global thinking and personal opinion – put the other in the observer position, meta-position where consensus appears and motivation originates. Biosystemic offers a detailed analysis of intra-organization process in a new perspective: balancing the interests of the organization and those of its employees. It is a very precise diagnosis of the causes and consequences of failures that we all face. It provides pragmatic and simple to implement meta-rules . Biosystemic aims to encourage employee commitment and to bring them into favorable psychological conditions for performance with minimizing the barriers. It discusses the rules of a systemic within an approach that promotes growth and prevents stress. It allows you to unlock an individual’s strengths and annihilate the weaknesses of an organization. Axiom: Nobody likes to be punished for an act which he is not guilty / responsible. Any liability shall be made ​​operational by the powers associated with that responsibility. Without feedback, the individuals and the organization are blind. IFL provides a constructive feedback system both controlling and helpfull. Axiom: lever decision is always given to the person which is the core function. Core function means 25% of motivation according to temperament, sufficient skill for the task, information available and cost/human resource ratio. The OD prevents the individual to run after information, streamlines and accelerates the process. – Sure thing Albert; how about 12:45 at El Divino’s for a nice pizza? « Nowadays, we call similar organizations States, corporations, associations, cooperatives, and their only purpose is to satisfy some of the needs which individuals may have. A State enacts laws, a corporation produces and sells goods, products or services, an association harnesses various forces and a cooperative pools resources. It’s a fact, an organization that does not address individual needs, will necessarily end up going downhill and disappearing… It can be said, quite accurately, that all organizations basically satisfy the individual, wouldn’t you say? – Yes indeed, you’re right, Albert replied. – Yeah, that’s a fact, Albert approved. – Well, I wished to understand why. I realized that the company, as well as most organizations, satisfies a certain number of our colleagues’ needs — I would say basic needs: they can buy what they need to eat, to pay for housing, clothing, keep warm, live with a certain amount of comfort, with a mid-term vision of their future, own a small real estate capital for some of them, securing their old age… And so the company allows them to survive — whereby the expression ‘to earn a living’. – Let me go on, you’ll see what I’m driving at. What would happen if the company went further in satisfying the needs of its employees? – I don’t know, I can imagine that it would be rather expensive! What do you mean by « go further » ? Hearing those words, Albert began to smile… Quite clearly, he was visualizing a situation which was radically the opposite of the one he currently had to face. But very soon, his smile disappeared, replaced by an expression of perplexity. While listening to Albert, Peter opened his bag, digging his hand inside and bringing out a book. – It would only seem logical » Albert replied. « But, you’re talking about new models… Must we re-invent everything? While speaking, Peter was showing Albert the cover of a book. – «NeuroQuantis? Were you a science student, Peter? – Don’t worry, there’s nothing complicated about it, on the contrary it’s quite simple, and I’ve been able to test some of the tools mentioned in this book on myself and was able to observe rapid and concrete changes in my life… Shall I explain? Albert is a happy CEO; really happy. The company La Belle Verte, which he has been the leader of for the past six years now, is doubtlessly the most beautiful success of his long career as a CEO and provides him even more satisfaction than he would ever have dreamed possible at the time he graduated. Some people went to work elsewhere, others joined the company — with an incredible motivation; the media keep praising La Belle Verte and Albert is frequently invited to TV talk shows, whenever there is a debate about workers’ conditions, or organizations in general. Peter, on his end, after having successfully led the metamorphosis, has left the company for new adventures. He’s now a coach and consultant working for NeuroQuantis, the firm which helps organizations to implement NeuroQuantis. He feels fully invested and thrives in this new work. The answer to that is quite simple: don’t ever make it a ‘pill’! NeuroQuantis radically differs from all these programs promoted by « change management » experts. For these consultants, the organization is something mechanical, which leads them to presume that an individual who is the target of an action will react mechanically and adequately — with the desired behavior. For NeuroQuantis, an organization is biological in nature; the focus is mainly on disseminating new behavior patterns in the organization, and this, through “viral” channels. Explanation: As soon as an organization’s ‘flagship personalities’ — both in terms of management and of social connections — deliberately change their own behaviour in certain ways, soon after all of their co-workers will also, little by little, end up following suit and changing theirs. Just like a virus, NeuroQuantis’ change does not rock the boat. It brews and develops little by little in the company’s arteries until the time has come when we can ascertain that all co-workers have taken on new habits, longlastingly acquired new behavior patterns. All NeuroQuantis tools, including those which you’ve just had an insight into, facilitate the integration of ‘what you should do for it to work’. The change happens all by itself because it’s obvious, it’s how it has to work. Once this new awareness has been assimilated by the mind, the individual never goes back. We hope that you find this introduction useful. How can you proceed with integrating NeuroQuantis in your organization or professional life?